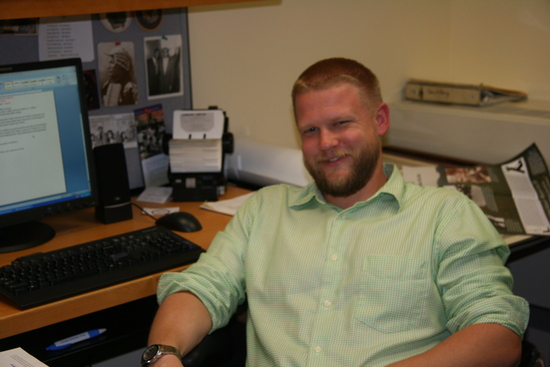 Ben Ford teaches at Indiana University of Pennsylvania. What’s the most interesting artifact you’ve ever found? I am very fond of the coffee grinder and coffee beans that were recovered from the Mardi Gras Shipwreck. The Mardi Gras Shipwreck is the remains of a circa 1815 vessel located 4000 feet beneath the surface of the Gulf of Mexico. This was the time when America’s caffeine addiction was shifting from tea to coffee because of ongoing hostilities with Britain and the ready availability of coffee from South America. Finding the coffee grinder on a ship lost between North and South America during this period of transition is a good example of how archaeology can make us reconsider the mundane. However, I can’t claim to have found this artifact. I was only one of more than 30 archaeologists, remotely operated vehicle pilots, crew members, ship captains, conservators, and others who were involved in recovering the artifact…but I still really like that coffee grinder. Who influenced your decision to become an archaeologist? I honestly, don’t remember who exactly influenced me to become an archaeologist, but I have the uncomfortable feeling that he might have had a whip and scar on his chin. On the other hand, I can say with certainty that Kent Vickery (University of Cincinnati) and John R. White (Youngstown University) influenced me to stay with anthropology and archaeology. They both showed me how much we can learn from the leavings of the past and how much fun it can be. I model many of my interactions with students on the way that Vickery treated me. My first real archaeological experience was at the Stubbs Earthworks Site in Warren County, Ohio. I learned a lot there, including that sometimes features are only distinguishable by texture and that an experienced excavator with one arm is far more valuable than a zealous 18-year old (me). I’m currently working on three sites: I’m working with avocational archaeologists to record the remains of what appears to be the wreck of Durham boat in Lake Oneida. Students and I are also conducting a geophysical survey outside of a Revolutionary War fort on an island in the St. Lawrence River. Closer to home in Pennsylvania, I have a long-term project at the Revolutionary War era site of Hanna’s Town where we are doing targeted excavations and grappling with a rich collection that goes back four decades. This. There was a brief period when I wanted to be a lumberjack, but I settled on archaeology pretty early…even if I didn’t know exactly what it was. I was lucky that, while archaeology didn’t meet my teenage expectations, the combination of physical and mental exertion appealed to me. It doesn’t hurt that being an archaeologist is better than having a real job. I am an SHA member because this is the only US organization that represents my interests as a maritime and historical archaeologist. The organization supports what I do by disseminating information and advocating for cultural resources, so I support what it does by being a member. I joined SHA during my first year of graduate school. I’ve been a member for 16 years. I was influenced by Charles Cheek’s “Massachusetts Bay Foodways: Regional and Class Influences.” I liked that it answered large-scale questions using data collected from CRM excavations. The journal on a day-to-day basis and the conference as a special treat. I almost always leave the annual conference energized about the potential for historical and underwater archaeology, but it is the journal that carries me through the year once the excitement of the annual meetings fades. I use the journal weekly in my research and teaching.